This second volume of THE GOLDEN RULES is a fascinating collection of insights designed to help people and businesses unleash their creative power. 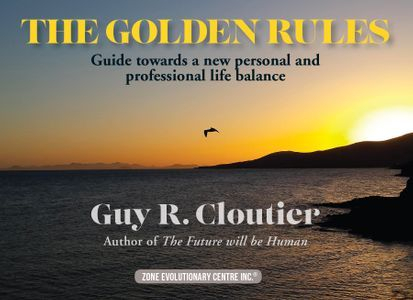 Author Guy R. Cloutier selected the essence of his visionary book The Future will be Human, to bring us a personal and professional life balance. He builds a bridge between the five senses and the five kingdoms to give meaning to our lives. Guy R. Cloutier International entrepreneur, lecturer, advisor and professior has always put human values at the core of his own life. His mission is to help people and businesses become free and autonomous. Published By: Zone Evolutionary Centre Inc.